For many years, I personally scripted every TV segment we produced at Alaska Channel. Some required historical research. Late in 1992, I found myself in the collections room of the Anchorage Museum when Dianne Brenner, an always helpful archivist, brought me a heavy box that had newly-arrived. It was stacked full of fragile glass plate photographs. 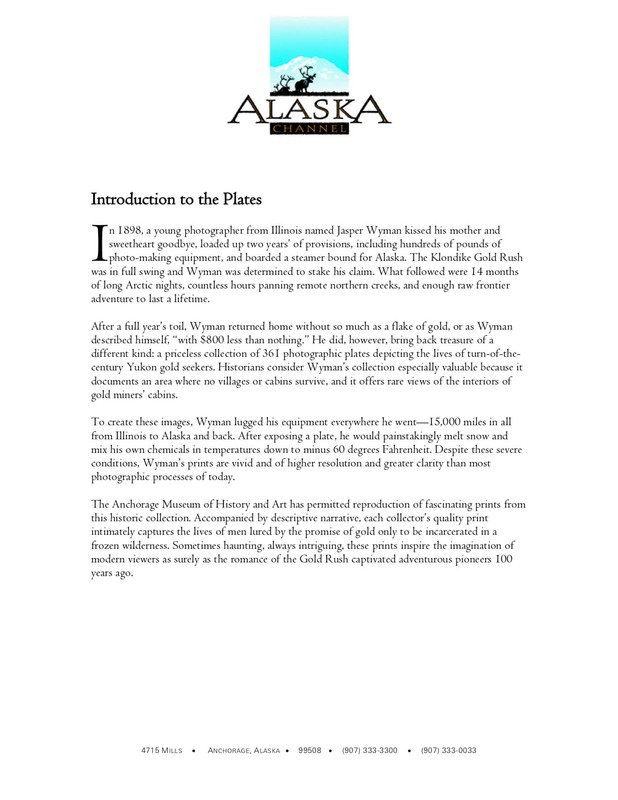 A gold-seeker and photographer named Jasper Wyman had produced them during the Klondike Gold Rush. At the time, I wasn’t even sure there was a field called repeat photography. If there was, I hadn’t heard of it. But something about Wyman’s images called to me, especially those showing people. I looked into the eyes of lives now long since gone and could not help but wonder: What did it feel like to live in their time? How were their lives different from mine? What did their lives amount to? The next summer, I hand-carried several dozen of the plates to San Francisco to make prints. And the following summer, in July of 1994, I set off for the Arctic to retrace Wyman’s footsteps. I was determined to locate these old places to find out for myself how different they looked—and felt—a century later. As a repeat photography project, the undertaking was an unqualified failure; I recreated exactly zero images. But as a life experience, it was transformative. I learned something about why I myself had moved to Alaska. 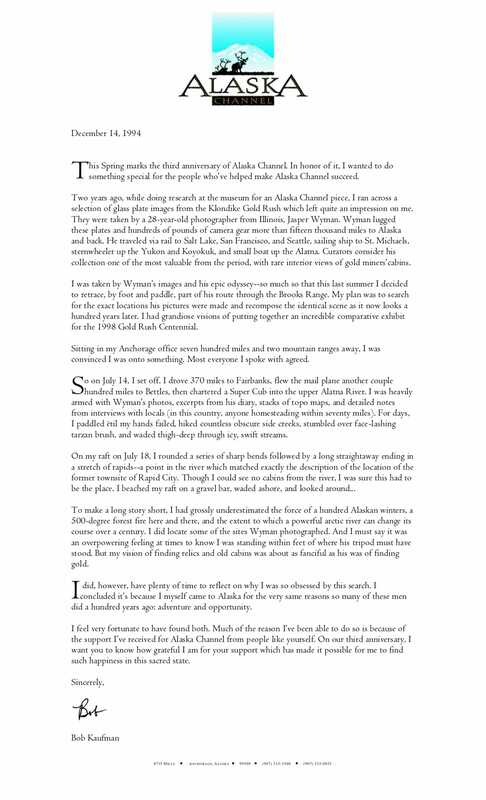 That fall, as a Christmas gift, I shared my revelation in a heartfelt letter to my Alaska Channel hotel partners and sponsors. I also created four plates, each containing a favorite Wyman image, along with an extended caption that I wrote. 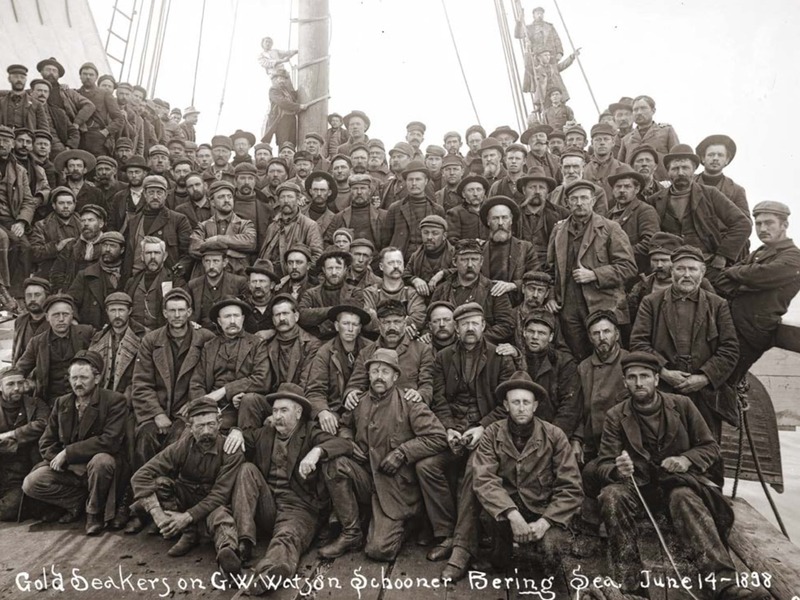 On May 16, 1898, five dozen men and a single woman jammed the decks of the G.W. Watson schooner for this photograph. 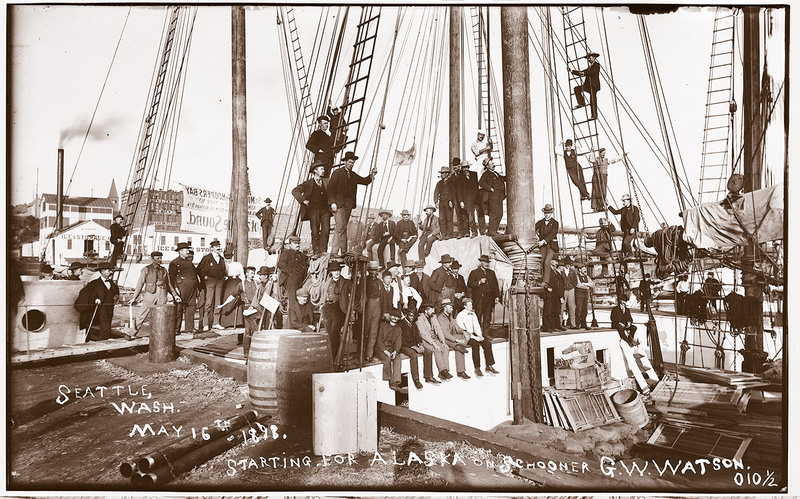 They were off to seek their fortunes in the gold fields of Alaska. Little did they know, they were also about to embark on the greatest journey of their lives—and to play their part in one of the wildest, most improbable affairs in the history of North America: The Klondike Gold Rush. Among their numbers was a young photographer from Illinois by the name of J.N. Wyman. Wyman nor any of his party ever struck gold. Yet he was to return with a treasure more lasting: 367 glass plate images of the fevered dash for gold, now in the safe keeping of the Anchorage Museum of History and Art. Wyman lugged these fragile plates 15,400 miles to Alaska’s Interior and back. Though these stampeders had no way of knowing so, even as they gathered on deck for this farewell photograph, they were too late. 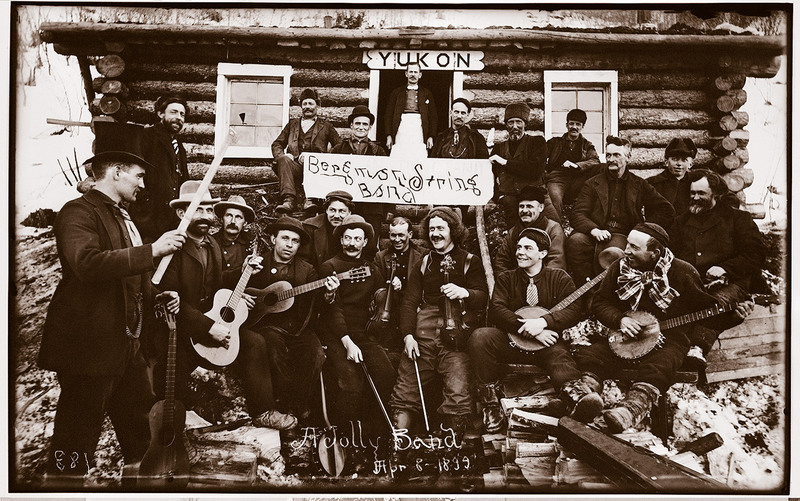 By the Spring of 1898, all the valuable claims had already been staked by prospectors who flocked to the Klondike from Fortymile, Circle City, and other soon-to-be ghost towns. Indeed, of 100,000 hopefuls who rushed the Klondike, only 400 ever struck it rich. Rapid City is one of dozens of settlements that sprang up along the riverbanks of the Alatna and Koyokuk the winter of 1898-99. In addition to these wall tents, it contained a half-dozen cabins. In July of 1994, an Alaska Channel film crew retraced its way to the very location where Wyman captured this image 96 years earlier. The river has long since taken any cabin remnants. Little remains to mark the camaraderie, aspirations, and industry which Wyman and his men visited upon this riverbank nearly a hundred years ago, save a few ground depressions where cabins once stood and spruce stumps where sawblades once drew. On the eve of the Gold Rush Centennial, Rapid City is a memory, an anonymous riverbank in the wilds of Alaska, the same as it has been since ancient times—but for one brief but spirited turn-of-the-century interruption. Caribou still roam its valleys, salmon still migrate its rivercourse, and the nearest settlement is still the village of Allakaket, 96 miles downriver. 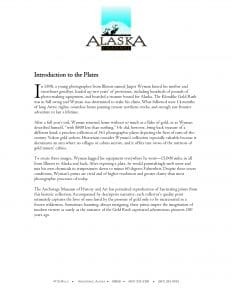 Alaska’s Brooks Range is one of increasingly few places on earth which today looks exactly as it did a hundred years ago, a place which offers a rare glimpse of a great wilderness which once extended across North America. 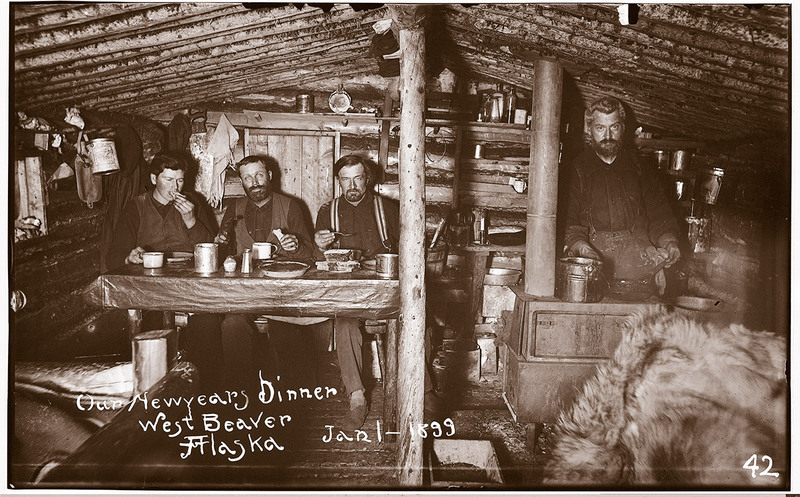 Imagine celebrating New Year’s Eve imprisoned in a dark and windowless 14- by 16-foot cabin with three other grown men, separated from family by 6000 miles of wilderness and three months of treacherous travel. These men have not seen nor spoken with their families for eight months. 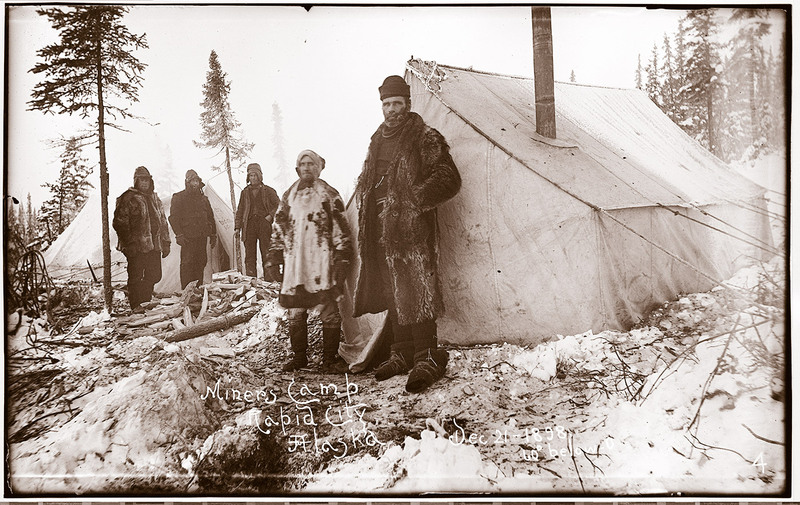 What few letters travel upriver by dogsled take four months to arrive, for the townsite of “West Beaver” lies on the Alatna more than a thousand frozen river miles from the mouth of the Yukon. It is ten days past solstice in Alaska’s Brooks Range, a time when winter sets down like an iron vise. The mercury can hover for weeks at forty to sixty below, cold enough to make rocks give up and shatter. The long arctic night stretches on for days, dark enough to crush men’s spirits. Eyes and facial expressions reveal dispirited men, unable to muster even a smile for their New Year’s Eve portrait. For them, the romance of the Gold Rush has soured. Failed in their quest for gold, longing only to return the comforts of home, they are incarcerated in a frozen wilderness fifty miles north of the Arctic Circle—and will be until May when the river ice breaks up. Wyman, the photographer, is seated second from left, his remote shutter release cord concealed by bread in his left hand. After exposing the plate, Wyman would melt snow, carefully mix in chemicals, and develop his own plates. The menu for their New Year’s Eve dinner consisted of soup, spaghetti, potatoes and gravy, bread, canned pineapples, pie, and cocoa to drink. This is one of the nicer Gold Rush cabins, with a boarded rather than dirt floor, a sloped rather than flat roof, and some side-peeled logs. 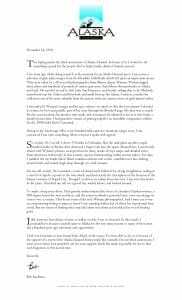 The formation of this string ensemble reveals a little-appreciated quality of frontiers: the human striving for refinement and culture in even the crudest of outposts. Yet these are the faces of rich men, changed men who gained more in one year chasing their fortunes in the northern wilderness than most learn in decades. They learned of obstacles they could conquer, the value of friendship, and the rewards of following dreams.